An Erection System intended for those who need the best. 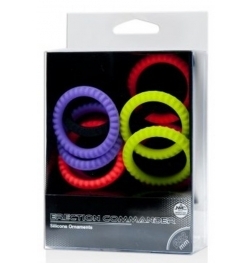 Wear these 3 rings together or independently for new climax sensations. You get 3 super-stretchy clear cockrings. 3 levels of confidence: amazing, extraordinary and tight. Utilize one ring as you would regularly, or utilize two rings for harder erections or each of the 3 for an out of this world erection. Try different things with where you put them on the pole, together or separated, and transform your erection into an affection machine. Check out more of Adam and Eves adult toys.